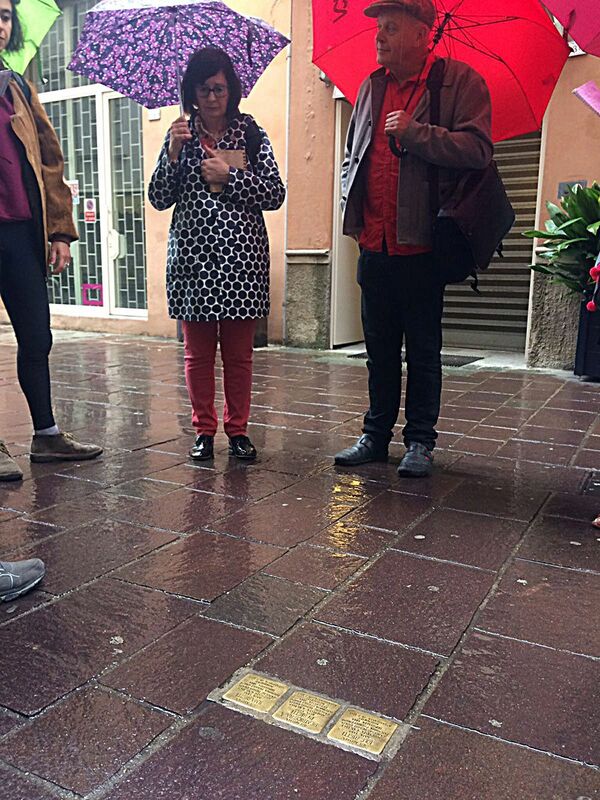 We walk with our new friends to Via Monzermone 8, a narrow street where we are shown three stolpersteine . 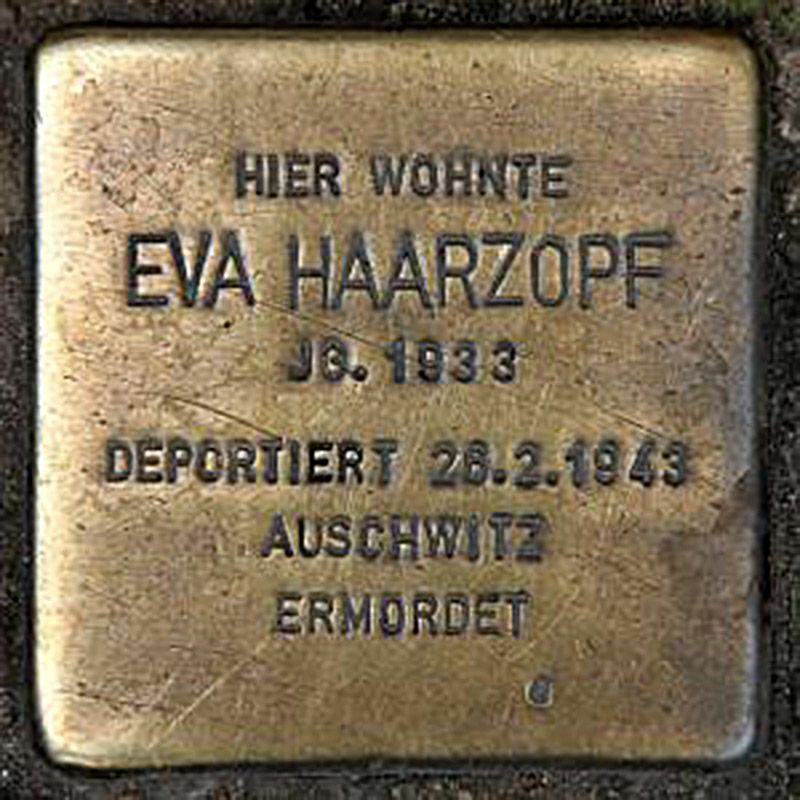 . .
Gunter placed the first Stolpersteine in Berlin for 50 Jewish inhabitants of the district of Kreuzberg. They were illegal then. There was no press, no police, no relatives, just a few curious onlookers. Now, there are over 7,000 in the German capital alone and almost 60,000 across Europe, from Trondheim, Norway in the north to Thessaloniki, Greece in the south, Orel, Russia in the east and l'Aiguillon-sur-Mer, France in the west. He places each one himself. It is the biggest decentralised monument in the world. In 1943, the city was occupied by the Germans. All Jewish citizens, once protected, were rounded up and deported to Fossoli, a holding camp, and then transported to Auschwitz. How many times have we heard this story? And still it fills us with dismay. The stumbling stones have been placed here in memory of three women; Beatrice Rava and her two daughters Ilma and Iole. They had lives here and then one day, someone attempted to erase them. Their names and their devotion to one another remain outside the house where they lived. 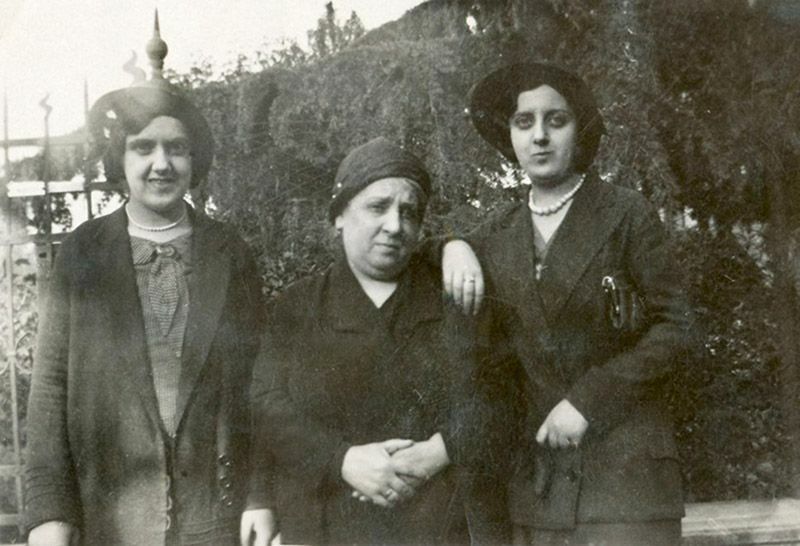 When they arrived at Auschwitz, the mother, being older, was selected for the gas chambers. The daughters were selected for slave labour but they chose to stay with their mother and so all three of them were murdered. We are told that they travelled on the same transport train as Primo Levi. This is interesting to hear but it is the women we are thinking about and already mourning. Stolpersteine are local memorials to those who disappeared from their homes during WW11. However, they are also about the present. If you kneel down to read the text on each one, very quickly you begin to think that person was my age when he was murdered or the age of my daughter, or born the same year as my grandmother. You start to reflect, you start to wonder what would have happened to you. What would you have done if you had noticed that the family in the opposite flat had disappeared in the middle of the night? What would you do today if your neighbours disappeared? They are a way of making incomprehensible numbers individual, of making cold facts personal. They are also a warning on streets where people live and work. Whilst there was anti-Semitic oppression in fascist controlled Italy, Jews were much safer within Italy and its sphere of influence than anywhere in Germany or territories under Nazi control during WWII. Mussolini may have been a ruthless dictator like Hitler, but he didn't share or actively participate in the Nazis' programme of exterminating European Jewry. However, that situation changed almost overnight once Italy ousted Mussolini and tried to capitulate to the Western Allies who had already landed on Italian soil in the south. From September 1943, Nazi Germany occupied the northern half of Italy and grabbed the opportunity of suddenly having “access” to Italy's Jews. Within weeks the round-ups and deportations to the east began. The first couple of trains went straight to Auschwitz, but the Nazis preferred to assemble the victims in transit camps before sending them on larger deportations by train. Fossoli became one of the most important transit camps in Italy. It was basically a concentration camp, but inmates stayed there a short time before being moved on to the death camps. Initially, Fossoli was set up in 1942 as a POW camp for British soldiers who had been taken prisoner in North Africa, but from September 1943, it housed mainly political prisoners and Italian soldiers who refused to co-operate with the new masters. Next to the initial tented buildings, new solid barracks were constructed from bricks. It was the main concentration and transit camp for Jewish victims from late 1943 and all through the first half of 1944. In total 3000 Jewish victims are believed to have passed through Fossoli during the Holocaust. Most of these were sent to Auschwitz-Birkenau and Bergen-Belsen. After WWII the older part of the Fossoli camp was reclaimed for agricultural use. The newer part, with the brick barracks, continued to be used as a refugee camp for Holocaust survivors. The grounds of the camp were later acquired in the 1980s and turned into a memorial.